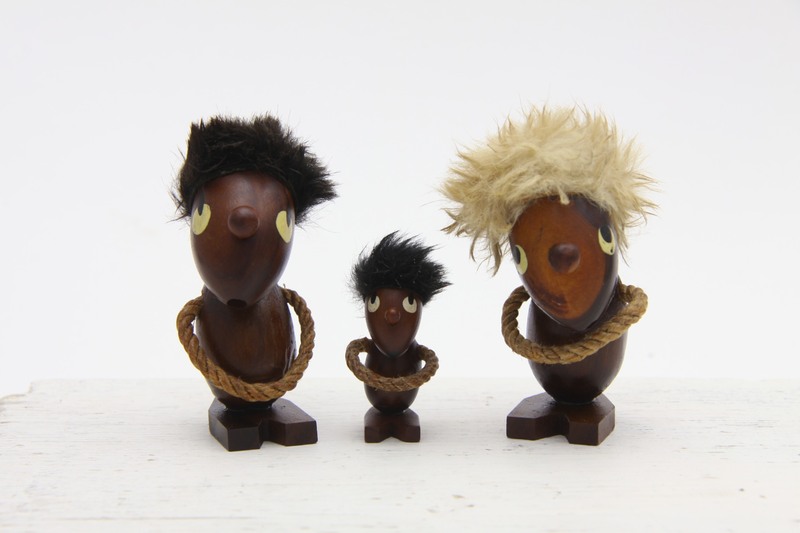 These are a Great trio of Danish Modern Teak trolls, attributed to Hans Bolling, Denmark circa 1960’s. A Fantastic mini set, comprising of miniature troll figurines the ‘Optimist’, ‘Pessimist’ and a tiny presumably child troll! All made out of teak, with rope arms and rabbit fur hair and painted eyes. In Great Vintage Condition, some thinning of the rabbit fur hair, couple of tiny nicks to the wood, maybe from production as they are so small, nothing to detract on display. The two larger figures measure approx 7 x 3.5 x 3.5cm / 2.75 x 1.5 x 1.5in. The small figure measures 4 x 2 x 2cm / 1.5 x 0.75 x 0.75in.